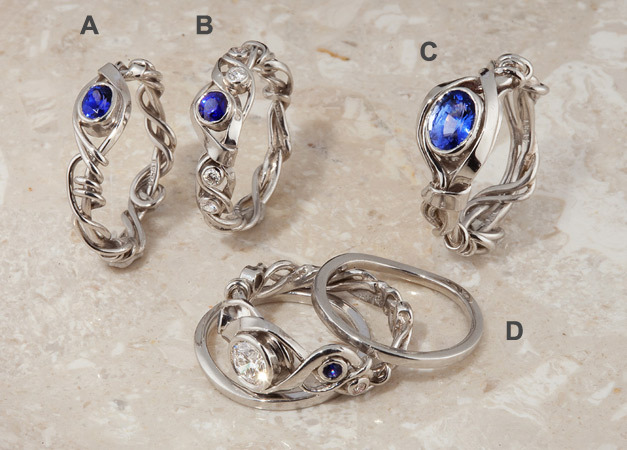 A. Vine Series: This ring is a three strand platinum band forged and woven, 6mm at top tapering to approximately 3mm toward back with a bezel set .30 ct AAA fine sapphire; each cross over is soldered. B. Vine Series: This band is 6mm wide at top tapering to 2mm at back, 3 strands of platinum forged and woven with a centrally set .18 ct. AAA fine blue sapphire flanked by 2 diamonds set to each side totaling .13 cts. C. Vine Series: This ring is 9mm at top tapering to approximately 3mm towards back; the band is four strands of platinum forged and woven with a centrally bezel set 1.10 ct. oval AAA fine blue sapphire. D. Vine Series: Three ring set, guards are 1.5 x 1.5mm platinum curved to fit interior three strand weave with a centrally set .50 ct SS2 G color round brilliant diamond flanked on each side by one sapphire and one diamond. Please call the store for prices.